Taking in the entire breadth and scope of rock group Chicago’s storied career, it’s difficult to fathom the immenseness of the band’s journey, their accomplishments, forays in to a multitude of musical genres, and ability to survive in the ever changing climate of popular culture. After all, this is the first American rock band to chart Top 40 albums in six decades, and is the highest charting American band (# 13) in Billboard’s list of Top 100 artists of all time. With the recent highlights of performances with the Chicago Symphony Orchestra, and inclusion of their very first album, ‘Chicago Transit Authority’ (1969), in to the Grammy Hall Of Fame, the band is currently riding a new wave of enthusiasm and confidence. Maximum Ink’s Sal Serio got to speak to founding member, keyboardist, vocalist, and composer, Robert Lamm, in advance of Chicago’s upcoming Wisconsin appearances (April 28 at Overture Hall in Madison, May 1 at Fox Cities Performing Arts Center in Appleton, and two dates at Milwaukee’s Riverside Theatre – April 30 & May 4). MI: Chicago is a band that may be more well known for it’s logo and it’s songs, than for any individual band member. MI: Do you think that some day the “brand” may continue even with the absence of any original members, and, how would you feel about that? RL: Well, it’s sort of heading in that direction, isn’t it? 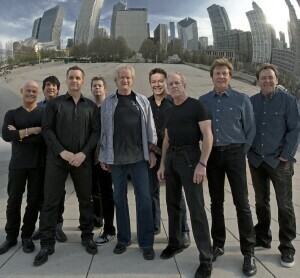 We are now a nine-tet, and Jimmy, Lee, Walt, and myself are still around. The other guys, like Jason and Keith, Jason especially, have been around for 28 years or some crazy number like that, and [they] are all very committed to being in Chicago. Our newest member, percussionist Walfredo de los Reyes [Jr.], grew up in Puerto Rico and Cuba, and one of his first two albums was a Chicago album, so he grew up knowing the music. So, they’re all committed to performing the music as close to the original recorded versions as possible, and still maintaining their own identity. Audiences love it, because we sound like Chicago, and we sound like Chicago because we are Chicago, and as you say, the songs are what make it happen. MI: I’ve seen recent video footage and your vocals are as strong as ever. What is your secret? RL: I did spend some years with a coach, because I sort of hit a wall, back in the early 90s. I would be out on tour, and we’d do a sound check, and I’d blow my voice out. So, I went to a coach and actually learned how to sing. That was the secret! (laughing) Instead of just flying by the seat of my pants as I had done for all of my career up to that point, I actually learned how to sing. Essentially, I learned how to warm up and what to do. As you can imagine, singing five nights a week, while traveling for 100 to 200 shows a year, does cause some wear and tear, and sometimes you kind of need to sing around your problems, and I learned how to do that. But, that aside, I think I’ve learned what songs to sing, and what songs not to try to sing. I’ve haven’t had to adjust the keys that the songs are in, downward, like many artists do as they get older. I just sing more. When I’m not working on Chicago stuff, I’m working on solo stuff, and I’ve just concentrated on trying to be a better singer. I don’t really consider myself a great singer, but within the parameters of what I do and how I write, I feel relaxed when I sing. That’s the key, being relaxed. Not pushing, and straining, and trying to be something you’re not. MI: The first Chicago album recently got a Grammy Hall Of Fame award. MI: What memories do you have of the time the group spent recording that album? RL: It was very much like the first time you went to Disneyland. The first time, you sort of have an expectation of what you think it might be like, but when you actually walk through the gate, it’s nothing like you expected. It’s ten times better, and in some ways intimidating, and you’re given an environment and tools that you’ve never had before. All of those things were occurring to all of us simultaneously. We recorded our first five albums in New York at the CBS Recording Studios complex, and they had several around Manhattan in those days. They were real professional, before digital recording, probably the height of technology at that point, and beautiful microphones, beautiful rooms, beautiful consoles… two inch tape! (laughing) So, all of it was really quite exciting, and we didn’t know what we were doing. We didn’t know the first thing about recording. We were not studio musicians, we were a bar band, essentially. MI: Do you think anyone had any sense of the staying power of that material? RL: No… how could anybody? RL: Well, I hoped somebody would like them. We liked them, but you know, that’s not always a bulletproof test, if an artist or a band likes their own material! (laughing) But, no, there’s no way that we were even thinking about that. We were very much “in the moment”, and very much in the process, and being very young and very naive, and really just depending on two things: our own intuitions, and Jim Guercio’s judgment and skills as a producer. Which, by the way, by the album being voted in to the Grammy Hall Of Fame, I think, underscores the timelessness of that album. Just in terms of audio arts, it’s a beautifully recorded album. We recorded it in an 8-track recording studio. It still sounds great. I think the weak link, if there is one, we listen now and the playing ability was limited to what we were able to do in 1968 or whenever the hell it was recorded. We’re all much better musicians now, so we think the weak link is our chops, and our ability to be as good as we could be. MI: It’s a lot different from the other releases. I’ve always felt it had more of a Chicago “the city” influence, rather than an L.A. vibe. Could that have been the case? MI: Prior to the Grammys, did you know that you would meet Chicago Symphony Orchestra music director Maestro Riccardo Muti? RL: We didn’t. We obviously knew that we were doing those two concerts with the Orchestra, which was something that our manager Peter Schivarelli had really worked hard to make happen. There were a lot of road blocks that he, and we, had to get over, to even be able to swing that whole thing. I was a fan of Riccardo Muti’s work, mostly with the stuff he’s done at La Scala, in Milan. So, I was excited just to maybe meet him. Whether or not his trip to Chicago accidentally coincided with our performances, or whether he had planned all along to get the word from somebody in the orchestra, that, “Yeah, these guys are okay. It’s safe!” (laughter) I don’t know. He definitely showed up for the second of the two concerts, and he was very charming, very complimentary and supportive, and he was very excited. He said, “We should do this again. We should record [and] film it.” Then, within a week, there were meetings between [he] and our manager to see if we could make that happen sometime in 2014. MI: That sounds like a very special meeting, and extremely memorable concerts. RL: Without a doubt! Over the past several years we had played with a number of orchestras, some very good orchestras, but the Chicago Symphony is an iconic symphony orchestra, and we were very well aware of the caliber of players that are invited to play in that orchestra. Actually, when I was at Roosevelt University, one of my studies was learning how to play upright bass, and I was taught by the first chair guy in the Chicago Symphony Orchestra, and this is while that orchestra had started winning Grammys for their symphony recordings. So, by the time we were rehearsing with the orchestra, prior to our two concerts in Chicago this year, we found out that the orchestra had earned, something like, 42 or 45 Grammys. (laughing) We’ve earned, like, one! So we told them right away we knew exactly what the pecking order was going to be! We were intimidated, and really honored to be allowed to perform with them. So, the whole thing was absolutely memorable, in every way. And, the orchestra themselves, individually and together, were totally in to it, and man, when they dug in to those charts, which we’d brought with us, they played like you would expect the Chicago Symphony to play! They played it with gusto and soul. MI: Chicago has really had a quite lengthy history playing concerts in Wisconsin and in this part of the country, for example D.J.’s Lounge in Madison, The Attic in Milwaukee, and of course the gigs on State Street at Barnaby’s in Chicago. When you come back to the Upper Midwest, is that connection still strong, and are those memories still fresh? RL: Yeah, sure! I’ve been on a very long tour across Canada, and there’s been a lot of time to just sit and reflect on the bus. (laughing) We’re sort of in the stage of our lives, where there is some reflection. You return to Chicago and immediately the old films start running in your head, and of course I remember playing at Barnaby’s, D.J.’s, and The Attic, and all of that. When one returns to where one started, I think it’s a way that the brain, and maybe the soul, reset. It’s kind of rebooting your self. It’s a way of embracing who you are and where you came from, to get ready to play again in that place. MI: I find it interesting that in the early days you all lived together, as a group, in “Holly House”, and of course you had all just pulled up roots and left Chicago and moved out to California together. What was that experience like? RL: It’s what 20-somethings do… to this day! I have a 25 year old daughter, she’s the baby, and she decided she couldn’t stand California, and she went to Wisconsin, she went to Boston, she went back to California, and then she went and lived in Berlin for a couple of years. She came home the beginning of this year, and lasted about two weeks in California, and now she’s in New York. That’s what kids do, that’s what we were doing. It’s a rite of passage to pack up, leave home, and to go strike out in to the world and see what’s out there. I found it really exciting. I think we all did. MI: What song from the group’s catalog really personifies Chicago to you? RL: This year, before we found out about the Grammy Hall Of Fame thing for the first album, we decided to start every show with the first song on the first side of our first album, which is “Introduction”. I do think that song is still quite meaningful to the band [and] to me, personally. There was some resistance in the band about doing the whole thing, because we had been doing a really badly cut down version, in a medley form, over the last [few] years. We’d put it in to the set, and take it out. Finally I said to the guys and to Peter Schivarelli, “I really think it would be a beautiful moment if we could just start the show with the first song on the first album, just as a touchstone moment.” And, it works. A lot of the audience doesn’t know the song [since they] didn’t join the party until ‘Chicago XVI’ or something. As a piece of music and they way we are able to perform it, it’s impressive. It’s like 6 or 7 minutes long. It kind of lays out the approach of what the band was, in the beginning, and, to a large degree, what it remains. So, I would have to say that song, “Introduction”. Terry Kath’s song. MI: There are a lot of dynamics in that song. RL: Yeah! Dynamics, and, it’s demanding! MI: You’re singing “Introduction” now, and you’ve said in the past that you feel Terry’s presence often. When you’re singing one of his songs, do the memories of Terry come flooding back? RL: They do, and I’ve only just recently avoided trying to imitate Terry! I started trying to hit the vocal very hard, as he did, but I’ve learned [that] it’s okay to just be me, and just sing the song. MI: I heard one of your new songs on the Internet, “Naked In The Garden Of Allah”. RL: Oh, really? Good for you! MI: I hear an Eastern influence in that composition, which was new to my ears. What was the inspiration behind that one? RL: The year that I first moved back to New York City, was when we were all watching Desert Storm on CNN, and going through that, up through, and in to, 9-11, and after that, the war in Iraq and Afghanistan, I’d done a lot of reading about the radical Islamic movement, and how wretched and counter-Allah it really is. We’ve all watched the movies made that have been set in the Middle East, and read the books. So, all of that informed that song, especially lyrically. I wrote [it], not as a song, but as a composition, and I tried to make it as cinematic as I possibly could in the space of 4 minutes. MI: What else is coming up later this year for Chicago? RL: We’re just now putting the finishing touches on what we think will be a 12 song album, including “Naked In The Garden Of Allah”. It will be released this Summer. We don’t know what it’s going to be called yet. I think the number thing is [our] 35th album. So, we’re very excited about that. We recorded all of it with our mini 96-bit studio that we carry with us everywhere we go, on the road. We want people to keep their eyes out, and their ears open, for the new Chicago album! It’s been a while since the band has released an all new album, top to bottom, of where we are at, musically. Later in the Summer, in August I think, we start a number of shows we’ll be doing with another Midwestern band, R.E.O. Speedwagon. Between now and then, in June and July, Chicago will be touring Europe, and again in October. We may go as far as… if there IS a Russia, and we don’t have to wear helmets, we’re going to be playing some dates [there], but we don’t expect anybody to make the trip over! We’ve got a good year ahead, and the plan is to continue recording, and that’s the most exciting thing for us. And, we did have a good time on the Grammys!